Not sure where to start drawing comics & graphic novels digitally? Or are you an old pro who's looking to increase output and smash deadlines? With this toolkit you can pencil, ink, color and even letter your own comic pages in one file directly in Photoshop. This toolkit provides my signature 11x17 Comic Page template for Photoshop +6 custom comic brushes. Has all the modern measurements and guidelines used by the big publishers plus I've included some alternative composition guides, built in perspective tool and added in many tips and notes on layers you can turn off and on. The comic brushes were made by me and include my pencil brush, ink brush, and 3 texture brushes for digital painting and roughing things up a little. These are my go to "old faithful" brushes that I've used in all of my published work and feel most like the pens and pencils I worked with on paper. I'm D.J. Coffman, I've been a freelance comic book artist for the past 18 years now. I used to "rule my own" bristol board back in the day. Cut by hand and laid down blue line guides to save money on the pre-ruled stuff. In 2006 when I created Hero By Night, I decided to take the plunge and try to move to drawing completely digital. When I first started out on my Wacom tablet, I wasn't quite confident enough to fully pencil and do all of the stages because it didn't "feel" like penciling to me. So I would pencil on board, scan it and then ink it in photoshop. 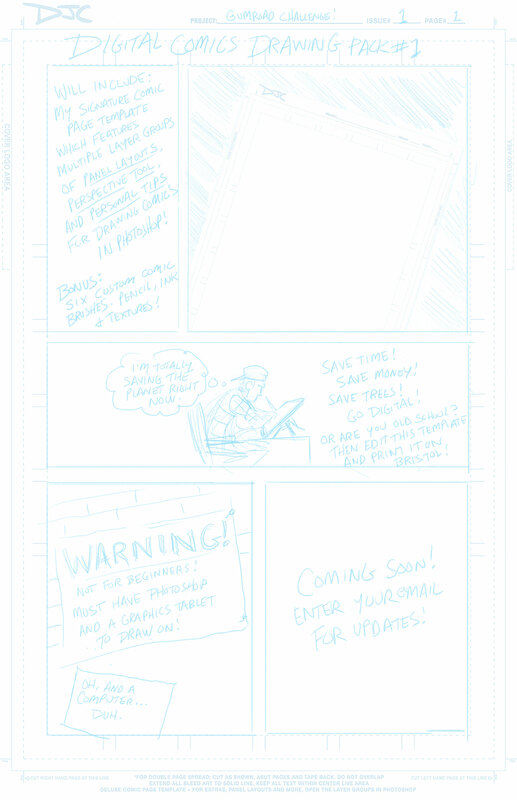 But I learned quickly that I could go from inking 1 -2 pages a day to 3-6! Over the years, brushes and technology have gotten WAY better and now with the right settings and toolkits like this one, I draw my entire comic within Photoshop. After nine years of fine tuning and tweaking my own Photoshop comic template & setup I'm happy to share it here for others to use and make their own. Enjoy!